Pet bird toys can provide your friend with hours of fun, entertainment, and even intellectual stimulation. Providing toys for your pet bird is absolutely essential. He needs toys to prevent boredom and keep his mind active. Without toys, your bird can easily develop behavior problems like screaming, feather plucking, and biting. It’s also a great way to enrich their environment with variety and entertainment. Pet bird toys come in all shapes, sizes, materials, and colors. However, all toys are not made for every bird. It’s important to provide the right toys for your pet bird’s particular species. Some toys for larger birds can be harmful to smaller birds and some toys for smaller birds can be harmful to larger birds. It’s important to know what to look for. Pet birds need a variety of different pet bird toys to ensure that their physical and mental needs are being met. Pick at least one parrot toy from each category to make sure your pet bird is happy, healthy, and well occupied. Foraging toys are highly recommended by avian professionals because they provide an outlet that requires your bird to work for his food like he would have to do in the wild. Stress and boredom can lead to your bird over-preening or feather plucking. Preening toys (such as rope) are a great outlet for birds to satisfy their need to preen. Shredding toys are also great for relieving stress and boredom for your pet bird. Nothing is more fun than tearing up a new toy! 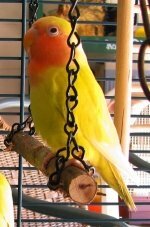 Chew toys are great for pet birds because chewing is a major part of a wild bird’s life. Chewing is especially important for larger parrots. Birds enjoy physical contact with each other in the wild. 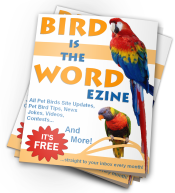 Pet birds need the same thing–they like to cuddle with or crawl into something soft. This help alleviate stress and provides a sense of security for your bird. Exercise toys such as swings and ladders are perfect for encouraging movement and physical exercise. For your own reference, and so you will know that the toys we recommend really are the best for your bird, we have outlined the most important toy features you need to take into consideration when shopping for toys on your own. We know toy hunting isn’t easy, so we’ve done the hard work for you and have found the best parrot toys on the market at the best prices and with the largest variety for each type of bird. Small Chew ToysChew toys are great for pet birds because chewing is a major part of a wild bird’s life. Chewing is especially important for larger parrots. We hope we’ve helped you in your bird toy hunting endeavor! Have You Found A Favorite Pet Bird Toy? Your comment may just help someone find a toy their bird would love!